Trinkets, gems, costume jewelery, bits of this and that. Whatever you call them, sparkling bits of vintage gold, silver, pearl, and shiny beads and jewels work together to create sentiment and adornment. Most women have broaches or other pieces of jewelry which have been passed down from a grandmother, mother, or aunt. Although many of these tidbits don't have much monetary value, they have great worth as heritage pieces that help us remember cherished people and times. A mother's ring, the broach worn on grandmother's coat, or the dangling earrings on Great-aunt Jo's ears all work to form visual pictures that are tied to warm memories and close relationships. Even as fashion changes so they are no longer considered stylish, they remain in jewelry boxes and trinket trays, reminding us of those we love. Pretty pieces like these also remind me of the story of Esther in the Bible, given the best of fragrances and jewels before her visit with the king. I wonder if she was able to keep those pieces and pass them along to her daughters and granddaughters; a reminder of her courage and bravery as she saved her people from harm. For me, this favorite Bible story emits it's own bond to my past; memories of reading the story over and over again and wondering about the brave queen. Today's photo is a small part of one woman's collection of vintage pieces given to Paula for her shop. Can you picture her in her hey-day, wearing these pieces with fashion flair? You can click on the picture for a larger view if you'd like. Isn't it interesting that we hold on to the vintage pieces that have memories, but there the sit in our jewelry boxes for no one to see. Sort of like we often do with special linens and dishes. The pendant with the hand painted rose is very pretty. Hi Sweet Friend! What a lovely endearing post! I can picture her tastefully adorned with these pretty treasures. I just love how you think! I am always refreshed inside and delighted when I visit you! You know I liked this post! I'm trying to catch up with you since my return from vacation. I love this post and the wonderful photos you included. 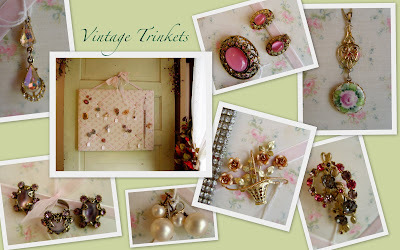 My heart is always touched by vintage trinkets and I cherish each one. My dear mother was blessed with many that belonged to my grandmother. I often sit and look at them and enjoy each part when my little mother wears them. And, at times, I sneak a peak into her jewel box just to capture a glimpse once again!